Martyn Woolford grabbed a late winner as Scunthorpe came from behind to beat Oldham and avoid a Carling Cup defeat. The League One visitors took the lead when Richie Jones ended a sweeping move by crossing for Djeny Bembo to nod in. Jonathan Forte, who also had a penalty claim waved away, levelled with a fine clipped shot after some superb control. After Oldham hit the bar, Woolford slammed in from 20 yards to win it for the hosts, who had Sam Togwell sent off late on after a second yellow card. 95:23 The match has kicked off. 90:00+4:31 Cross by Kieran Lee (Oldham), blocked by Jim McNulty (Scunthorpe). Outswinging corner from right by-line taken right-footed by Dale Stephens (Oldham) to near post, header by Andrew Crompton (Oldham) from centre of penalty area (12 yards), over the bar. 90:00+3:43 Defending throw-in by Jason Jarrett (Oldham). 90:00+3:23 Cross by Jason Jarrett (Oldham), clearance by Rob Jones (Scunthorpe). 90:00+3:00 Attacking throw-in by Paul Black (Oldham). 90:00+2:27 Foul by Jonathan Forte (Scunthorpe) on Kieran Lee (Oldham). Free kick crossed right-footed by Dale Stephens (Oldham) from right wing, save (punched) by Sam Slocombe (Scunthorpe). 90:00+2:02 Cross by Paul Black (Oldham), resulting in ball out of play. Defending throw-in by Jim McNulty (Scunthorpe). 90:00+1:16 Sent off Sam Togwell (Scunthorpe) dismissed for second bookable offence. 90:00+0:56 Attacking throw-in by Jim McNulty (Scunthorpe). 90:00+0:08 Cross by Jonathan Forte (Scunthorpe), blocked by Jason Jarrett (Oldham). Inswinging corner from left by-line taken right-footed by Michael Collins (Scunthorpe) to centre, clearance by Paul Black (Oldham). 89:08 Attacking throw-in by Jim McNulty (Scunthorpe). 88:48 Defending throw-in by Kieran Lee (Oldham). 87:15 Substitution Scunthorpe substitution: Chris Dagnall replaced by Bobby Grant (tactical). 87:15 Foul by Cliff Byrne (Scunthorpe) on Djeny Bembo-Leta (Oldham). Free kick crossed right-footed by Dale Stephens (Oldham) from left channel, resulting in ball out of play. Goal kick taken long by Sam Slocombe (Scunthorpe). 86:43 Cross by Cliff Byrne (Scunthorpe), clearance by Jason Jarrett (Oldham). 86:02 Attacking throw-in by Cliff Byrne (Scunthorpe). 85:28 Foul by Paul Black (Oldham) on Chris Dagnall (Scunthorpe). Direct free kick taken right-footed by Cliff Byrne (Scunthorpe) from own half, resulting in open play. Attacking throw-in by Cliff Byrne (Scunthorpe). 85:19 Defending throw-in by Cliff Byrne (Scunthorpe). 85:13 Defending throw-in by Cliff Byrne (Scunthorpe). 84:36 Substitution Oldham substitution: Lewis Alessandra replaced by Andrew Crompton (tactical). 84:29 Cross by Chris Taylor (Oldham), resulting in open play. 84:02 Defending throw-in by Jim McNulty (Scunthorpe). 83:53 Attacking throw-in by Kieran Lee (Oldham). 83:32 Attacking throw-in by Kieran Lee (Oldham). 82:31 GOAL - Martyn Woolford:Scunthorpe 2 - 1 Oldham Goal by Martyn Woolford (Scunthorpe) drilled right-footed (bottom-right of goal) from left channel (20 yards).Scunthorpe 2-1 Oldham. 81:37 Substitution Scunthorpe substitution: Michael O'Connor replaced by Michael Collins (tactical). 81:37 Attacking throw-in by Jim McNulty (Scunthorpe). 81:02 Outswinging corner from right by-line taken right-footed by Dale Stephens (Oldham) to out of play, resulting in open play. 80:28 Attacking throw-in by Kieran Lee (Oldham). 79:46 Cross by Kieran Lee (Oldham), clearance by Michael Raynes (Scunthorpe). Inswinging corner from left by-line taken right-footed by Dale Stephens (Oldham) to near post, clearance by Sam Togwell (Scunthorpe). 79:25 Cross by Djeny Bembo-Leta (Oldham), clearance by Michael Raynes (Scunthorpe). 78:58 Attacking throw-in by Kieran Lee (Oldham). 78:35 Attacking throw-in by Kieran Lee (Oldham). 78:27 Attacking throw-in by Kieran Lee (Oldham). 78:10 Attacking throw-in by Kieran Lee (Oldham). 77:53 Attacking throw-in by Kieran Lee (Oldham).Attacking throw-in by Kieran Lee (Oldham). 76:51 Free kick crossed right-footed by Dale Stephens (Oldham) from left wing, clearance by Cliff Byrne (Scunthorpe). 76:51 Booking Chris Dagnall (Scunthorpe) booked for unsporting behaviour. 76:51 Foul by Chris Dagnall (Scunthorpe) on Paul Black (Oldham). 76:06 Cross by Dale Stephens (Oldham), clearance by Cliff Byrne (Scunthorpe). 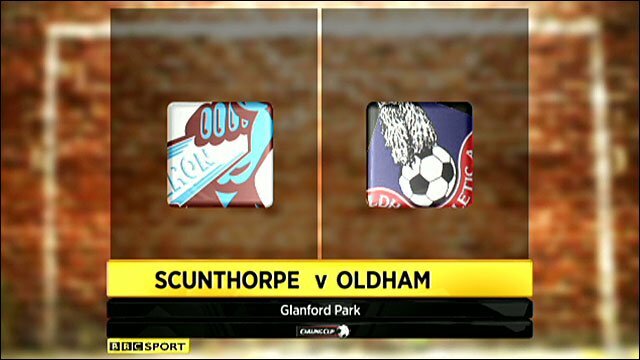 Inswinging corner from left by-line taken right-footed by Dale Stephens (Oldham) to centre, clearance by Martyn Woolford (Scunthorpe). 75:48 Foul by Michael O'Connor (Scunthorpe) on Chris Taylor (Oldham). Direct free kick taken right-footed by Dean Furman (Oldham) from right channel, passed. 75:10 Attacking throw-in by Cliff Byrne (Scunthorpe). 74:43 Foul by Dean Furman (Oldham) on Michael O'Connor (Scunthorpe). Direct free kick taken right-footed by Sam Slocombe (Scunthorpe) from own half, resulting in open play. 74:21 Attacking throw-in by Paul Black (Oldham). 74:07 Attacking throw-in by Paul Black (Oldham). 73:43 Foul by Jonathan Forte (Scunthorpe) on Jason Jarrett (Oldham). Direct free kick taken right-footed by Jason Jarrett (Oldham) from own half, passed. 73:05 Attacking throw-in by Kieran Lee (Oldham). 71:52 Shot by Jonathan Forte (Scunthorpe) drilled left-footed from left side of penalty area (18 yards), save (parried) by Dean Brill (Oldham). Inswinging corner from left by-line taken right-footed by Michael O'Connor (Scunthorpe) to near post, shot by Martyn Woolford (Scunthorpe) right-footed from centre of penalty area (12 yards), missed left. Goal kick taken long by Dean Brill (Oldham). 71:07 Handball by Jason Jarrett (Oldham). Free kick crossed right-footed by Michael O'Connor (Scunthorpe) from left channel, save (caught) by Dean Brill (Oldham). 70:45 Shot by Sam Togwell (Scunthorpe) drilled right-footed from right channel (20 yards), blocked by Jean Yves Mvoto (Oldham). Shot by Sam Togwell (Scunthorpe) drilled right-footed from right channel (20 yards), blocked by Jean Yves Mvoto (Oldham). 69:59 Foul by Djeny Bembo-Leta (Oldham) on Michael O'Connor (Scunthorpe). Free kick crossed right-footed by Michael O'Connor (Scunthorpe) from left wing, resulting in open play. 69:34 Cross by Garry Thompson (Scunthorpe), resulting in open play. Attacking throw-in by Jim McNulty (Scunthorpe). 69:21 Attacking throw-in by Cliff Byrne (Scunthorpe). 68:37 Foul by Rob Jones (Scunthorpe) on Chris Taylor (Oldham). Direct free kick taken right-footed by Lewis Alessandra (Oldham) from left channel, passed. Shot by Dale Stephens (Oldham) drilled right-footed from right channel (20 yards), over the bar. Goal kick taken long by Sam Slocombe (Scunthorpe). 68:00 Shot by Dean Furman (Oldham) curled left-footed from left channel (25 yards), missed left. Goal kick taken long by Sam Slocombe (Scunthorpe). 67:33 Defending throw-in by Cliff Byrne (Scunthorpe). 66:08 Substitution Oldham substitution: Dean Kelly replaced by Chris Taylor (tactical). 66:08 Shot by Kieran Lee (Oldham) drilled right-footed from right channel (20 yards), clearance by Michael Raynes (Scunthorpe). Inswinging corner from left by-line taken right-footed by Dale Stephens (Oldham) to near post, foul by Dean Kelly (Oldham) on Michael Raynes (Scunthorpe). Direct free kick taken right-footed by Sam Slocombe (Scunthorpe) from own half, resulting in open play. 65:58 Cross by Djeny Bembo-Leta (Oldham), clearance by Rob Jones (Scunthorpe). 65:33 Attacking throw-in by Paul Black (Oldham). 64:36 Assist (header) by Garry Thompson (Scunthorpe) from right channel. 64:36 GOAL - Jonathan Forte:Scunthorpe 1 - 1 Oldham Goal by Jonathan Forte (Scunthorpe) left-footed (high centre of goal) from centre of penalty area (12 yards).Scunthorpe 1-1 Oldham. 64:02 Defending throw-in by Kieran Lee (Oldham). 62:57 Cross by Chris Dagnall (Scunthorpe), resulting in ball out of play. Goal kick taken long by Dean Brill (Oldham). 62:11 Defending throw-in by Cliff Byrne (Scunthorpe). 61:47 Defending throw-in by Kieran Lee (Oldham). 61:30 Goal kick taken long by Dean Brill (Oldham). 60:58 Cross by Martyn Woolford (Scunthorpe), blocked by Kieran Lee (Oldham). Corner from left by-line taken short left-footed by Martyn Woolford (Scunthorpe). Cross by Michael O'Connor (Scunthorpe), resulting in ball out of play. 59:40 Attacking throw-in by Jim McNulty (Scunthorpe). 59:06 Goal kick taken long by Dean Brill (Oldham). 58:49 Foul by Djeny Bembo-Leta (Oldham) on Rob Jones (Scunthorpe). Direct free kick taken right-footed by Sam Slocombe (Scunthorpe) from own half, resulting in open play. 58:36 Goal kick taken long by Sam Slocombe (Scunthorpe). 57:15 Shot by Jason Jarrett (Oldham) drilled right-footed from right channel (30 yards), over the bar. 57:15 Booking Sam Togwell (Scunthorpe) booked for unsporting behaviour. 57:15 Foul by Sam Togwell (Scunthorpe) on Lewis Alessandra (Oldham). Direct free kick taken right-footed by Dale Stephens (Oldham) from left channel, passed. 57:02 Attacking throw-in by Kieran Lee (Oldham). 56:33 Attacking throw-in by Kieran Lee (Oldham). 56:26 Cross by Ritchie Jones (Oldham), clearance by Michael Raynes (Scunthorpe). 55:47 Foul by Rob Jones (Scunthorpe) on Dean Kelly (Oldham). Direct free kick taken right-footed by Jason Jarrett (Oldham) from right channel, passed. 55:18 Shot by Chris Dagnall (Scunthorpe) drilled right-footed from left channel (25 yards), missed left. Goal kick taken long by Dean Brill (Oldham). 55:10 Attacking throw-in by Jim McNulty (Scunthorpe). 54:50 Attacking throw-in by Cliff Byrne (Scunthorpe).Cross by Cliff Byrne (Scunthorpe), clearance by Jean Yves Mvoto (Oldham). 54:33 Defending throw-in by Cliff Byrne (Scunthorpe). 54:12 Attacking throw-in by Paul Black (Oldham). 53:03 Handball by Djeny Bembo-Leta (Oldham). Indirect free kick taken right-footed by Sam Slocombe (Scunthorpe) from own half, resulting in open play. 52:31 Foul by Martyn Woolford (Scunthorpe) on Kieran Lee (Oldham). Direct free kick taken right-footed by Dean Brill (Oldham) from own half, resulting in open play. 52:00 Foul by Ritchie Jones (Oldham) on Martyn Woolford (Scunthorpe). Direct free kick taken right-footed by Sam Slocombe (Scunthorpe) from own half, resulting in open play. 51:44 Attacking throw-in by Jim McNulty (Scunthorpe). 51:26 Attacking throw-in by Kieran Lee (Oldham). 51:04 Defending throw-in by Jim McNulty (Scunthorpe). 50:43 Defending throw-in by Jim McNulty (Scunthorpe). 50:24 Attacking throw-in by Kieran Lee (Oldham). 49:20 Foul by Ritchie Jones (Oldham) on Michael O'Connor (Scunthorpe). Direct free kick taken right-footed by Sam Slocombe (Scunthorpe) from own half, resulting in open play. 46:37 Ritchie Jones (Oldham) caught offside. Indirect free kick taken right-footed by Sam Slocombe (Scunthorpe) from own half, resulting in open play. 45:59 Foul by Jean Yves Mvoto (Oldham) on Jonathan Forte (Scunthorpe). Direct free kick taken right-footed by Michael O'Connor (Scunthorpe) from right channel, resulting in open play. Cross by Martyn Woolford (Scunthorpe), resulting in open play. 45:15 Cross by Garry Thompson (Scunthorpe), resulting in ball out of play. Goal kick taken long by Dean Brill (Oldham). 45:00+1:13 Defending throw-in by Paul Black (Oldham). 45:00+0:33 Goal kick taken long by Sam Slocombe (Scunthorpe). 45:00+0:01 Defending throw-in by Kieran Lee (Oldham). 44:38 Defending throw-in by Cliff Byrne (Scunthorpe). 43:46 Shot by Martyn Woolford (Scunthorpe) drilled right-footed from left side of penalty area (18 yards), save (caught) by Dean Brill (Oldham). 43:15 Attacking throw-in by Jim McNulty (Scunthorpe). 42:21 Cross by Ritchie Jones (Oldham), shot by Dean Furman (Oldham) drilled left-footed from left channel (20 yards), blocked by Rob Jones (Scunthorpe). 41:57 Foul by Dean Kelly (Oldham) on Rob Jones (Scunthorpe). Direct free kick taken right-footed by Sam Slocombe (Scunthorpe) from own half, passed. 41:27 Attacking throw-in by Paul Black (Oldham). 41:08 Attacking throw-in by Kieran Lee (Oldham). 39:35 Foul by Martyn Woolford (Scunthorpe) on Kieran Lee (Oldham). Free kick crossed right-footed by Dale Stephens (Oldham) from right wing, foul by Jean Yves Mvoto (Oldham) on Rob Jones (Scunthorpe). Direct free kick taken right-footed by Sam Slocombe (Scunthorpe) from own half, resulting in open play. 39:27 Defending throw-in by Jim McNulty (Scunthorpe). 37:31 Cross by Michael O'Connor (Scunthorpe), save (caught) by Dean Brill (Oldham). 37:31 Substitution Scunthorpe substitution: Josh Wright replaced by Sam Togwell (injury). 37:31 Booking Jason Jarrett (Oldham) booked for unsporting behaviour. 37:31 Foul by Jason Jarrett (Oldham) on Martyn Woolford (Scunthorpe). 36:52 Goal kick taken long by Sam Slocombe (Scunthorpe). 36:18 Cross by Michael O'Connor (Scunthorpe), save (caught) by Dean Brill (Oldham). 35:39 Attacking throw-in by Jim McNulty (Scunthorpe). Correction - 34:37 Foul by Djeny Bembo-Leta (Oldham) on Rob Jones (Scunthorpe). Direct free kick taken left-footed by Sam Slocombe (Scunthorpe) from own half, resulting in open play. 34:37 Foul by Djeny Bembo-Leta (Oldham) on Rob Jones (Scunthorpe). Direct free kick taken left-footed by Rob Jones (Scunthorpe) from own half, resulting in open play. 33:43 Cross by Kieran Lee (Oldham), clearance by Cliff Byrne (Scunthorpe). Cross by Paul Black (Oldham), save (caught) by Sam Slocombe (Scunthorpe). 33:14 Foul by Chris Dagnall (Scunthorpe) on Jean Yves Mvoto (Oldham). Direct free kick taken left-footed by Paul Black (Oldham) from own half, resulting in open play. 32:49 Defending throw-in by Cliff Byrne (Scunthorpe). 32:26 Attacking throw-in by Kieran Lee (Oldham). 31:45 Goal kick taken long by Sam Slocombe (Scunthorpe). 31:18 Foul by Michael O'Connor (Scunthorpe) on Dean Furman (Oldham). Direct free kick taken right-footed by Jason Jarrett (Oldham) from own half, resulting in open play. 29:04 Foul by Paul Black (Oldham) on Martyn Woolford (Scunthorpe). Free kick crossed left-footed by Martyn Woolford (Scunthorpe) from right wing, clearance by Ritchie Jones (Oldham). Outswinging corner from right by-line taken right-footed by Michael O'Connor (Scunthorpe) to centre, header by Rob Jones (Scunthorpe) from centre of penalty area (12 yards), missed right. Goal kick taken long by Dean Brill (Oldham). 28:28 Attacking throw-in by Jim McNulty (Scunthorpe). 28:10 Attacking throw-in by Jim McNulty (Scunthorpe). 27:50 Attacking throw-in by Jim McNulty (Scunthorpe). 27:37 Cross by Cliff Byrne (Scunthorpe), clearance by Kieran Lee (Oldham). 27:32 Attacking throw-in by Chris Dagnall (Scunthorpe). 26:38 Defending throw-in by Kieran Lee (Oldham). 26:14 Cross by Jonathan Forte (Scunthorpe), clearance by Jason Jarrett (Oldham). 25:36 Cross by Djeny Bembo-Leta (Oldham), resulting in ball out of play. Goal kick taken long by Sam Slocombe (Scunthorpe). 24:34 Foul by Michael O'Connor (Scunthorpe) on Dean Furman (Oldham). Free kick crossed right-footed by Dale Stephens (Oldham) from left channel, clearance by Michael O'Connor (Scunthorpe). Attacking throw-in by Kieran Lee (Oldham). 24:00 Attacking throw-in by Paul Black (Oldham). 22:41 Assist (cross) by Ritchie Jones (Oldham) from right channel. 22:41 GOAL - Djeny Bembo-Leta:Scunthorpe 0 - 1 Oldham headed goal by Djeny Bembo-Leta (Oldham) (bottom-left of goal) from centre of penalty area (12 yards).Scunthorpe 0-1 Oldham. 21:46 Attacking throw-in by Jim McNulty (Scunthorpe). 21:26 Defending throw-in by Jim McNulty (Scunthorpe). 20:52 Attacking throw-in by Kieran Lee (Oldham). 20:09 Defending throw-in by Kieran Lee (Oldham). 19:54 Foul by Dean Kelly (Oldham) on Michael Raynes (Scunthorpe). Direct free kick taken right-footed by Cliff Byrne (Scunthorpe) from own half, resulting in open play. 19:39 Shot by Chris Dagnall (Scunthorpe) volleyed right-footed from right channel (35+ yards), save (caught) by Dean Brill (Oldham). 18:31 Foul by Garry Thompson (Scunthorpe) on Kieran Lee (Oldham). Direct free kick taken right-footed by Dean Brill (Oldham) from own half, resulting in open play. 17:46 Defending throw-in by Jim McNulty (Scunthorpe). 17:16 Attacking throw-in by Lewis Alessandra (Oldham). 15:44 Shot by Lewis Alessandra (Oldham) drilled right-footed from left channel (30 yards), save (caught) by Sam Slocombe (Scunthorpe). 14:03 Shot by Jonathan Forte (Scunthorpe) drilled left-footed from left side of penalty area (12 yards), save (parried) by Dean Brill (Oldham). Inswinging corner from left by-line taken right-footed by Michael O'Connor (Scunthorpe) to far post, header by Rob Jones (Scunthorpe) from right side of six-yard box (6 yards), missed right. Goal kick taken long by Dean Brill (Oldham). 13:06 Foul by Lewis Alessandra (Oldham) on Cliff Byrne (Scunthorpe). Direct free kick taken right-footed by Sam Slocombe (Scunthorpe) from own half, resulting in open play. 12:26 Attacking throw-in by Paul Black (Oldham). 11:30 Defending throw-in by Jim McNulty (Scunthorpe). 11:14 Attacking throw-in by Paul Black (Oldham). 10:34 Attacking throw-in by Chris Dagnall (Scunthorpe).Jonathan Forte (Scunthorpe) caught offside. Indirect free kick taken right-footed by Dean Brill (Oldham) from own half, resulting in open play. 9:57 Attacking throw-in by Paul Black (Oldham). 9:03 Goal kick taken long by Sam Slocombe (Scunthorpe). 8:39 Attacking throw-in by Kieran Lee (Oldham). 8:24 Handball by Djeny Bembo-Leta (Oldham). Indirect free kick taken left-footed by Cliff Byrne (Scunthorpe) from own half, passed. 8:02 Foul by Michael Raynes (Scunthorpe) on Dean Kelly (Oldham). Direct free kick taken right-footed by Dale Stephens (Oldham) from left wing, passed. 7:03 Cross by Jim McNulty (Scunthorpe), clearance by Lewis Alessandra (Oldham). Outswinging corner from right by-line taken right-footed by Michael O'Connor (Scunthorpe) to far post, header by Michael Raynes (Scunthorpe) from centre of penalty area (18 yards), over the bar. Goal kick taken long by Dean Brill (Oldham). 6:35 Shot by Jonathan Forte (Scunthorpe) right-footed from centre of penalty area (12 yards), save (caught) by Dean Brill (Oldham). 6:07 Defending throw-in by Kieran Lee (Oldham). 5:49 Defending throw-in by Kieran Lee (Oldham). 4:52 Defending throw-in by Cliff Byrne (Scunthorpe). 4:31 Cross by Djeny Bembo-Leta (Oldham), clearance by Cliff Byrne (Scunthorpe). 3:44 Defending throw-in by Kieran Lee (Oldham). 3:10 Cross by Garry Thompson (Scunthorpe), resulting in ball out of play. Goal kick taken long by Dean Brill (Oldham). 2:50 Attacking throw-in by Cliff Byrne (Scunthorpe). 2:38 Defending throw-in by Paul Black (Oldham). 2:02 Goal kick taken long by Sam Slocombe (Scunthorpe). 1:06 Cross by Jim McNulty (Scunthorpe), shot by Martyn Woolford (Scunthorpe) left-footed from right side of penalty area (18 yards), over the bar. Goal kick taken long by Dean Brill (Oldham). 0:33 Defending throw-in by Paul Black (Oldham).